BabyBlueOnline: Episcopal Presiding Bishop calls Archbishop of Canterbury's request "bizarre" and Church of England's canon requirements "nonsense"
Episcopal Presiding Bishop calls Archbishop of Canterbury's request "bizarre" and Church of England's canon requirements "nonsense"
THE PRESIDING BISHOP of the Episcopal Church has taken as a personal affront the Overseas and Other Clergy (Ordination and Ministry) Measure 1967, saying the request by the Archbishop of Canterbury’s staff that she conform to English law was “bizarre”. On June 16 Bishop Katharine Jeffer ts Schori told members of the Episcopal Church’s Executive Council that a “statement” from Lambeth Palace had requested she “not to wear a mitre at Southwark Cathedral,” when she presided at the Eucharist on June 13. “It is bizarre; it is beyond bizarre,” she said. The Presiding Bishop’s umbrage with Lambeth Palace comes amidst a whirlwind tour of the Communion, with visits this month to the General Synods of the Scottish Episcopal Church and the Anglican Church of Canada, the USPG’s annual conference, and visits next month to New Zealand and Australia. Bishops attending the Episcopal Church’s College of Bishops training programme last month, tell The Church of England Newspaper that in a late evening session the chancellor to the Presiding Bishop, Mr David Booth Beers, said the trip would help build a coalition amongst the liberal-leaning provinces of the Communion in opposition to the Dr Williams’ policies. A spokesman for the Presiding Bishop declined to comment on reports the Presiding Bishop was seeking to build a rival American-centred Communion, saying she would not comment on “speculation and conjecture”. Supporters of the Presiding Bishop protested that the request by Lambeth Palace that she conform to the laws governing the Church of England were a “snub” and “sexist”. In protest to this request, Bishop Jefferts Schori brought her mitre to the service, but did not wear it, merely carrying it with her as she processed down the aisle. 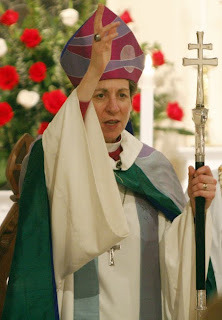 American canon lawyer AS Haley has argued the controversy is a false one, as Dr Williams has no discretion in this matter to accommodate the Presiding Bishop’s feelings about her status as a bishop in England. While Bishop Jefferts Schori preached at Salisbury Cathedral before the 2008 Lambeth Conference, her visit to Southwark was the first time she had both preached and presided at a Eucharist in the Church of England, Mr Haley noted. The act of officiating at a Eucharist, rather than assisting or preaching, required her to seek the permission of the Archbishop of Canterbury. A “license to officiate under the Archbishop of Canterbury is a licence to perform an ecclesiastical function at a service within the Church of England, and neither the Arch- bishop nor Queen Elizabeth II has any legal power to licence a woman to preside as bishop over a Eucharist within the Church of England,” Mr Haley said. Bishop Jefferts Schori’s embarrassment followed a polite but pointed dressing down by the Archbishop of Cape Town at the USPG conference at Swanwick on June 10. In his address entitled “Spirit and Culture at the Foot of the Cross”, Archbishop Thabo Makgoba chided the Episcopal Church say- ing that while the Episcopal Church claimed to be listening to the Holy Spirit, “within your Province there has not been enough listening to the rest of the Anglican Communion”. The full story of George Conger's report is in the Friday, June 25th edition of Church of England Newspaper. You know, I've been saying that very same thing for about four years now. Her mitre collection -- now THAT is bizarre. Is that a crosier KJS is holding? It looks more like a double cross. How appropriate. I think "Anonymous" is right and we need to get used to it: not many people care about want any church or its leaders do. Welcome to the diaspora.